The purchased model is ATX230EHL, designed for intensive use. 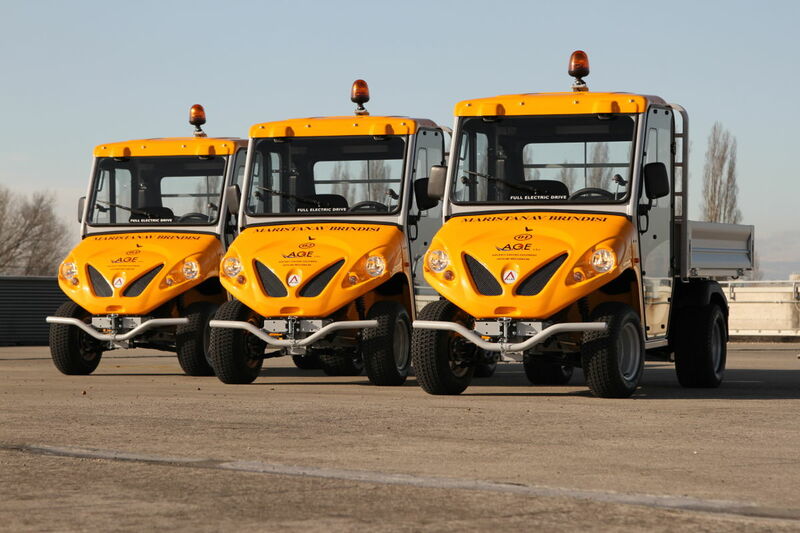 The Navy has chosen the high performances of the Alkè electric vehicles for the ordinary and extra ordinary management operations of the port of Brindisi. The purchased model is ATX230EHL, designed for intensive industrial use. The Italian Navy, which has always been subject to rapid growth with a deep rooted history and full of important events has chosen the high performances of the Alkè electric vehicles. After the upgrade of the former Arsenal, the town of Brindisi has become the Third Naval Unit in the area, following La Spezia and Taranto. Maristanav Brindisi is currently the independent facility that manages the naval station composed of a 800 tonne floating dock offering logistic assistance to ships berthing on the base. For the assistance activity provided to the ships at berth, Maristanav Brindisi has chosen the Alkè vehicles that are used during transport of merchandise and materials during the ordinary and extraordinary management operations of the port. 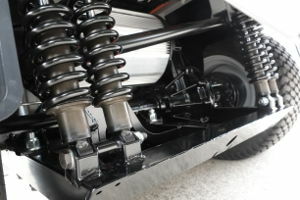 The chosen vehicles are three ATX230EHL equipped with cargo bed and drop sides. The cargo bed measures 2000x1300 mm, the largest one of the series, guaranteeing a high load capacity. In case of adverse weather conditions, the cargo bed may be equipped with a cover to guarantee damage free transportation. 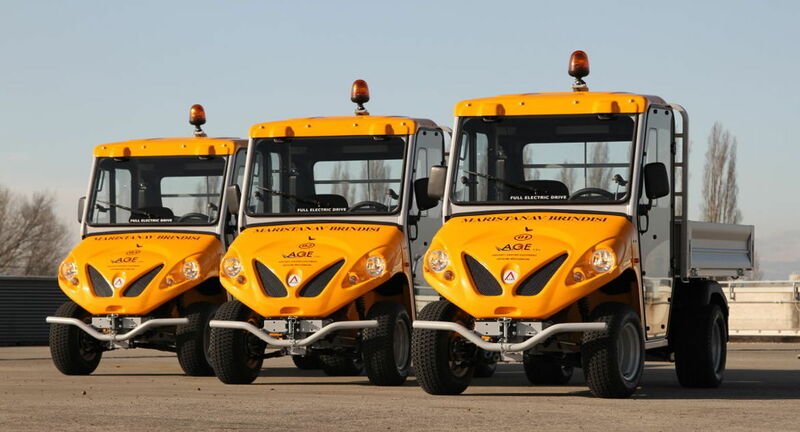 The zero-emission vehicles Alkè ATX230EHL are part of the Heavy Duty series, i.e. the series exclusively designed to fulfil industrial needs. 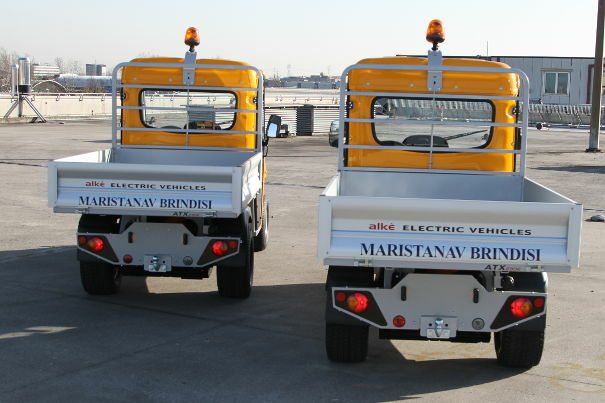 The ATX230EHL vehicles used by Maristanav Brindisi can reach 25km/h and are able to tow up to 4,500 kg. The high engine power allows the vehicle to overcome even steep slopes, up to 20%. The driver compartment is spacious, comfortable and may perfectly accommodate two operators together with all the necessary equipment. The seats are equipped with seat belts and the compartment, complete with a 12V socket, may be equipped with all the comfort options. It can actually be provided with the heating and/or air conditioning system, if the model with doors is selected. There is also the possibility to choose whether to add the window or not. The Navy is fully committed to preserve the environment and limit the pollution. For years, it has implemented water monitoring projects in order to reduce the pollution of the seaside areas and of the groundwater. The choice to use electric vehicles for the management of the docking and logistics operations, relying on the long-standing experience of Alkè in this sector is fully in line with the green policy of Maristanav Brindisi. The ATX230EHL vehicles are professional vehicles suitable for intensive industrial use. The resistance capacity and the endurance under intense operating conditions make these vehicles perfect for harbours, ports, logistic centres, stations and airports. The long-life battery and the short recharge time of only 8 hours allow to make full use of the entire work shift, guaranteeing maximum productivity.